Mesmerizing mime, astonishing acrobats, over-the-top costumes and state-of-the-art technology combine in thrilling performances by Montreal’s reknowned Cirque du Soleil. Don’t expect elephants and dancing bears. The closing of Ringling Brothers Circus has brought an end to that traveling band of big name circus performers. No, this isn’t your classic circus. Rather, it’s what our TravelingMom likes to call cirque nouveau. 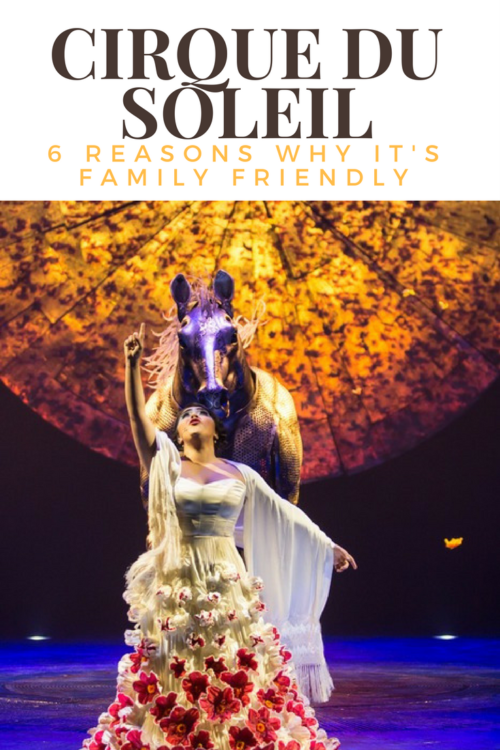 Here are 6 reasons why Cirque du Soleil is magnifique and family-friendly! Founded in 1984, Cirque Du Soleil has become its own blockbuster brand, creating dozens of shows that have played to millions across the globe. They’ve become somewhat informal ambassadors for French Canadian culture. They’ve been performing in Las Vegas for decades now and have become one of the most popular family-friendly acts in Sin City. 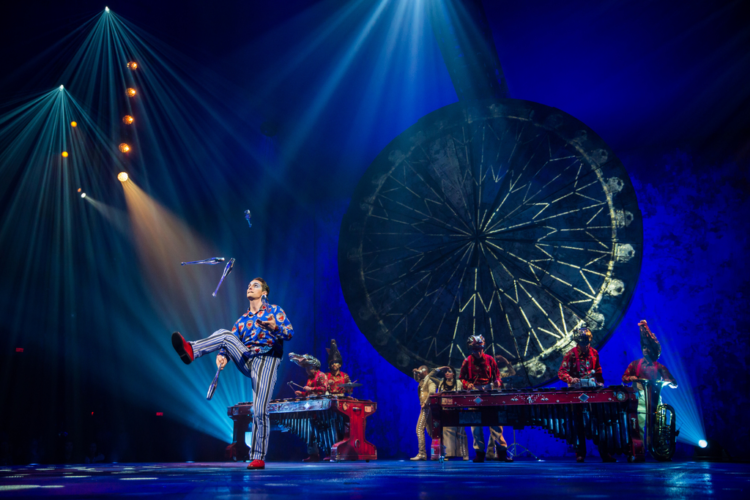 Along with their own unique productions like “Luzia,” they’ve partnered with famous musical brands like the Beatles and Michael Jackson to create unforgettable theatrical experiences. 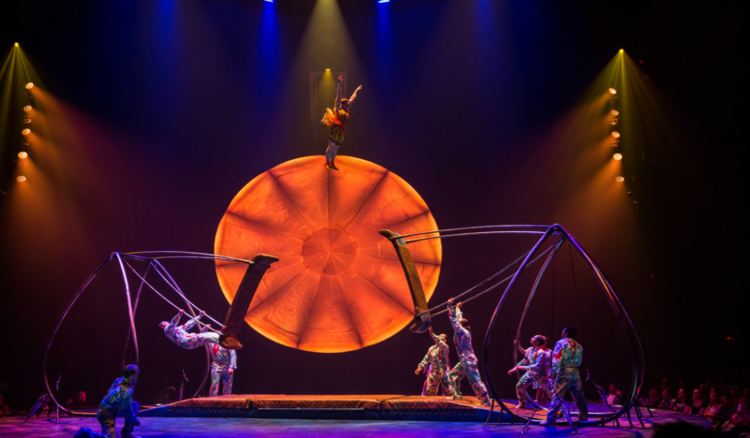 Cirque du Soleil has permanent shows in places like Las Vegas and Orlando, but they also tour the country with new shows, making it easy for most families in the U.S. to catch one of their shows. Every two years Cirque du Soleil returns to Chicago with a new show that combines imagination with spectacle. We’ve seen both “Kurios” and “Luzia: A Waking Dream of Mexico” in a traditional big top circus, set up just outside Chicago’s United Center. That stadium’s home to the Chicago Bulls and Blackhawks, just west of the downtown Loop. Families will enjoy seeing the statue of basketball great Michael Jordan. The United Center is just two miles west of the city’s hip restaurant row on Randolph Street. These restaurants may be a bit upscale for younger kids. However, if your family wants a really special evening, where you’re dining with locals in a non-touristy foodie restaurant, consider dinner on Chicago’s Randolph Street before your show. You could walk from the Loop to your restaurant, then grab an Uber to the United Center. Well known for their acrobatic showmanship, Cirque shows also include a lot of eye candy. There’s stunning design, make-up and costumes. Think of it as performance art. I liken it to a family-friendly cabaret. The show feels like you are sitting in a a surreal Salvador Dali painting. The colors are so rich and the events that are happening seem absolutely impossible, as hypnotic as Dali’s mind-boggling paintings. As a result, it is often hard to know exactly where to look on the stage. There are so many incredible things happening at once. I might look at a juggler, while finding myself distracted by the incredible costumes on neighboring characters. In addition, during “Luzia” there were the sounds coming from the incredible singer, who resembled a Frida Kahlo-like character in her colorful costume. On that note, the show’s lively Mexican music makes the performance feel like a fantistical fiesta. The Frida Kahlo character serves as a chanteuse and M.C. througout the show. Every Cirque show features gasp-worthy performances. 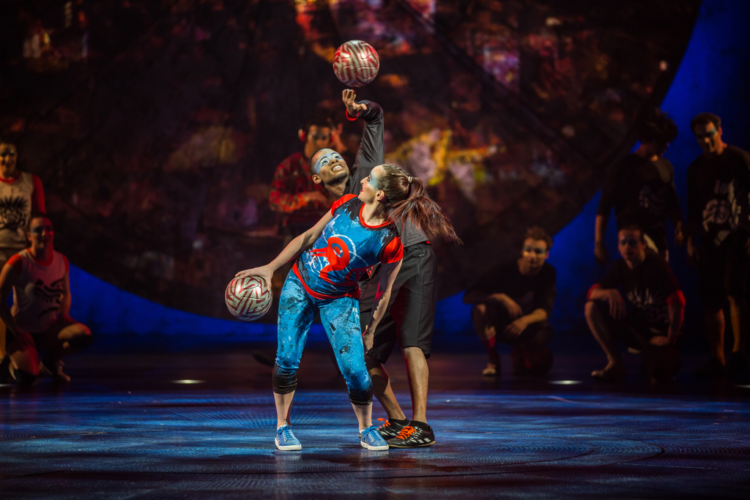 A few of my favorites from “Luzia” were the man and woman juggling soccer balls, using their feet, their head, their back, their elbows, every part of their body in a delightful dance. A beautiful way to honor the country’s favorite sport. Another “Luzia” highlight was the unbelievable Russian contortionist Aleksei Goloborodko. This was beyond gasp-worthy. This guy made you shake your head in disbelief. 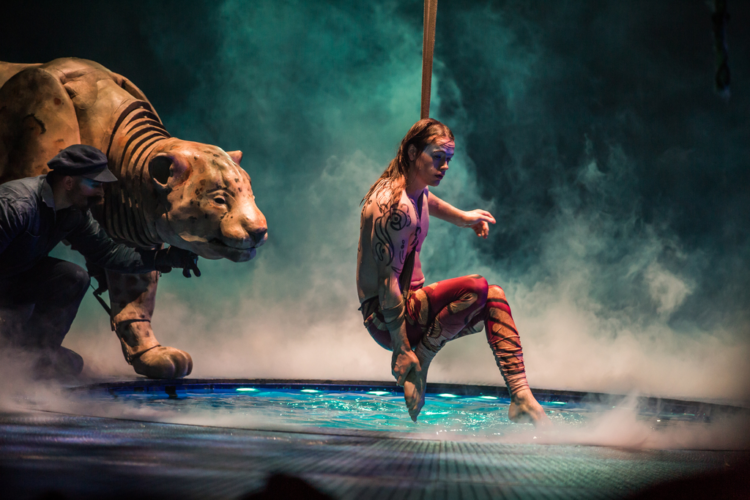 Special effects are a big part of the Cirque productions, as well. 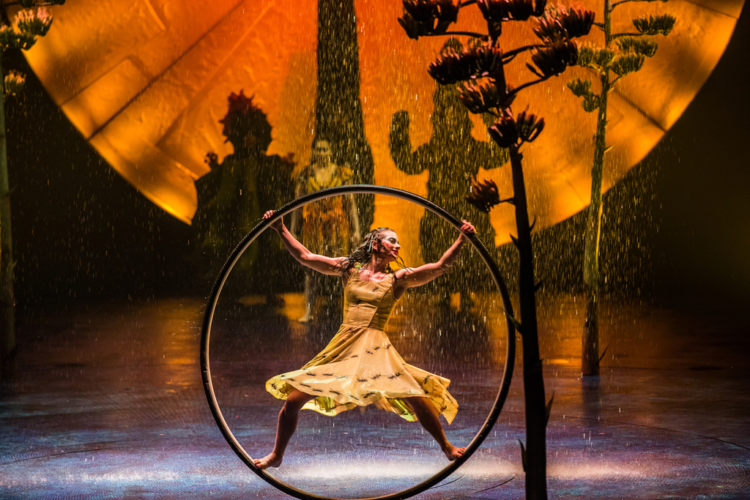 In “Luzia,” water was a recurring theme throughout the show. State-of-the-art special effects had water raining down the center of the stage, symbolizing… oh, I don’t know… maybe, rebirth? Even if I didn’t get the symbolism quite right, the spectacle of rain pouring down on the acrobats was remarkable. The delights just never seem to end in Cirque du Soleil shows. Know how sometimes you find yourself squirming or uncomfortable in your chair at the theater? Maybe your kid will ask, “How much longer is this show?” There’s not a minute of that in a Cirque du Soleil show, not one second. Especially relevant to Cirque du Soleil are the costumes and set design. In “Luzia,” a large steel horse is brought to life by performers. A rain forest landscape magically appears, with performers bringing colorful birds and assorted jungle animals to life. All this will hold your attention, but most noteworthy are the acrobats, who really throw you for a loop, pardon the pun. High-flying trapeze artists somersaulting their way through eye-popping routines. Cirque du Soleil performances are dreamlike yet funny, beautiful and experimental. If you go, it’ll be an evening of family-friendly mind blowing entertainment, for kids as well as parents. Have you ever seen Cirque du Soleil in performance? What was your experience? Let us know! Next Post: Living Souvenirs: How to Grow 6 Stunning Hawaiian Flowers at Home.